Tonight don’t forget to turn your clocks back an hour. How I remember that they go back is by this easy little phrase ‘ Spring Forward, Fall Back’. The clocks change at 2am tonight (Saturday night) so that means an extra hour in bed, wahey! This week John Lewis sent me a lovely sleep pack filled with a John Lewis goose feather down pillow, John Lewis silk pillow case, eye mask, candle, mini alarm clock and Neal’s Yard Sleep Concentrate which I was very eager to try out. Alongside these sleep goodies I was armed with sleep expert Dr Neil Stanley’s sleep tips, who believes if you have the perfect conditions you should be able to get a good night’s sleep. I put some of these tips and tricks to the test to see if they could help me sleep and get even more hours in bed. This is something I am guilty of, not turning off the TV and still checking my phone in bed until it falls on my head from being that tired, yep we have all been there. All these things stimulate the mind and affect your ability to get to sleep but I never knew that these devices all emit blue light which can suppress the release of the sleep hormone melatonin. Dr Neil recommends turning off all these devices at least 30 mins before bed and enjoying a calm bath or reading a book instead to wind down, plus lowering the lights can also help. So I took a nice bath a few hours before bed, lit my Neom Complete Bliss Moroccan Blush Rose Lime & Black Pepper Candle £30 and enjoyed a few chapters. It definitely does help to calm my mind down, I am guilty for going to bed tired and then lying there thinking about everything. Taking myself away from laptop and phone too is a great way to step away from accidentally doing more work. This was a tip I knew I needed to really sort out. Making sure your bedroom is a place of rest and relaxation and ready for sleep. So I first of all cleared all my clutter. I have products and general bits and bobs everywhere, so I had a good old tidy up and got myself some lovely storage boxes from Muji which has just recently opened in Angel, so I popped along and picked a few up, they are perfect for putting all my make-up together. This is where the John Lewis goose feather pillow £35 comes into play, it is so soft and the silk pillow case £35 is the softest bedding I have ever experienced, I’m contemplating buying the whole set! It really helped to make me feel comfortable in my bed and feel relaxed. This is something I already do if I can’t get to sleep. If I can’t fall asleep when I go to bed, I always get up rather than lying in bed tossing and turning and it resets my mind, I sit up for a while, read a magazine or something and then head back to bed and it has always worked on helping me get to sleep. For me I don’t struggle with light but if you do pop on a sleep mask. If you don’t get the right amount of sleep it will definitely tell on your face. 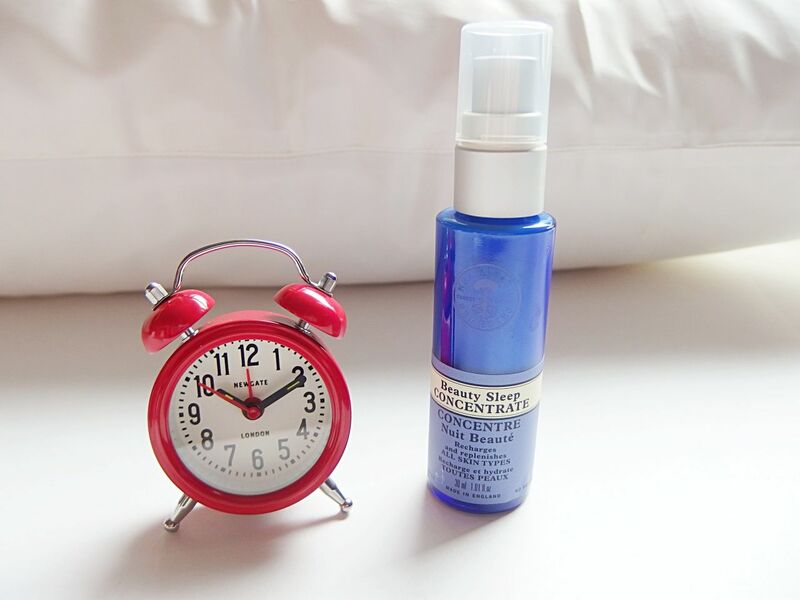 I applied the Neal’s Yard Beauty Sleep Concentrate £31.50 to my face, it is packed with antioxidants to leave your skin moisturised and nourished as you sleep and has a blend of aromatherapy oils which are known for their calming properties so it’s the perfect cream to use whilst sleeping to help recharge the skin, oh and if that’s not enough it reduces lines and wrinkles. I have only tried this once so far, but really felt like my face look recharged in the morning, that combined with a good night’s sleep and your onto a winner. Setting an alarm clock for the same time each day, gets your body in a routine. Dr Neil says that ‘our bodies like regularity and by setting a daily wake up time your brain is able to make the most efficient use of the time you spend asleep.’ I’m pretty good at waking up around the same time each day, but when I set the alarm I seemed to wake up just before it went off, so my body definitely knew something! Have a happy extra hour (or more) sleeping this weekend!